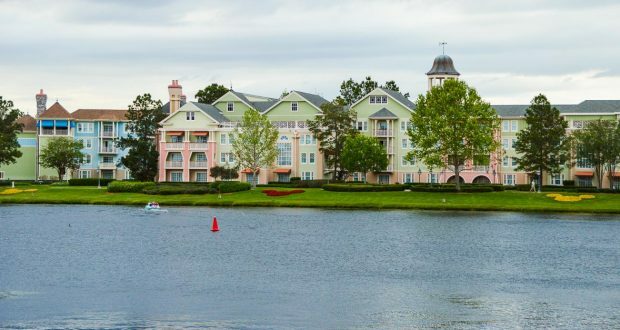 With more than 30 resorts on Walt Disney World property, there is easily something for everyone. You really can’t go wrong with any of the Disney resorts, no matter which one you choose! It’s definitely hard to decide which one to stay at, so it helps to weigh the pros and cons. 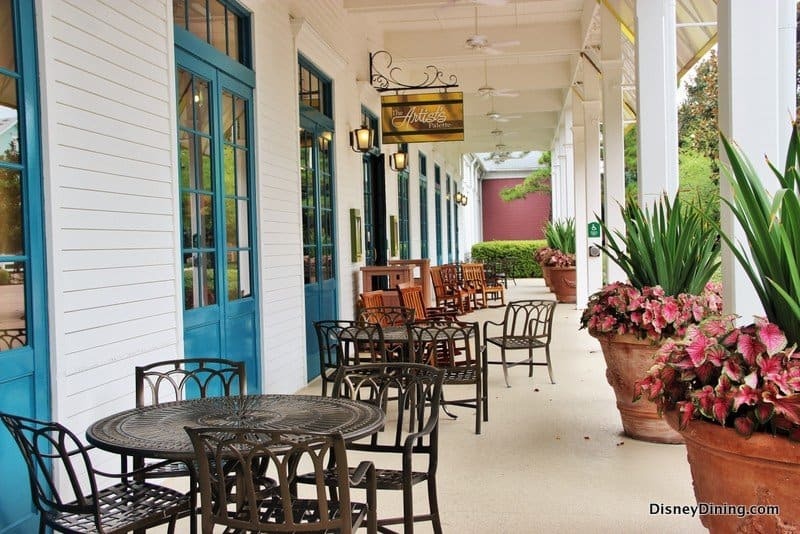 Situated on the Sassagoula River, Disney’s Saratoga Springs Resort and Spa is perhaps not as well known as other options on Disney property, but it has many qualities to consider. Need to escape from the hustle and bustle of the parks? 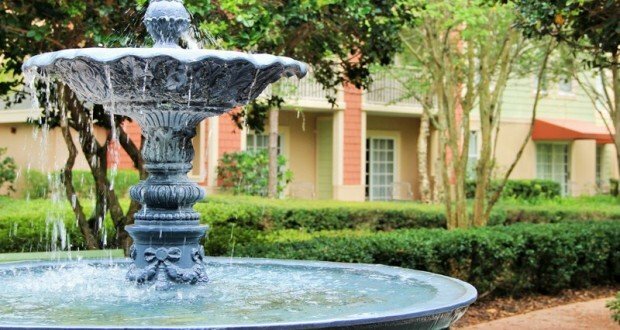 Then you’ve come to the right place, because Saratoga Springs is situated around beautiful fountains, lush greenery, and the Lake Buena Vista golf course. Guests can take a relaxing stroll down the many shaded walkways in the cool of the morning, or to enjoy the sunset after a busy day. There are five separate areas, or communities, that make up this resort: the Grandstand, the Carousel, the Paddock, Congress Park, and the Springs. These sections are spread spaciously around the resort, making it feel almost like each area is its own separate resort. The downside to this is if you’re staying in a few of the areas and want to check out the main building, the Carriage House, for a meal, to purchase groceries, or to use the main pool, it’s going to be a hike. Congress Park and the Springs are the two closest areas to the Carriage House, and they are also the two most requested sections to stay in. In the mood to head over to Disney Springs for an enjoyable meal, great shopping, or terrific entertainment? You’re in luck, because Saratoga Springs is right across the waterway. In fact, guests staying in the Congress Park area can see Disney Springs from the shoreline. 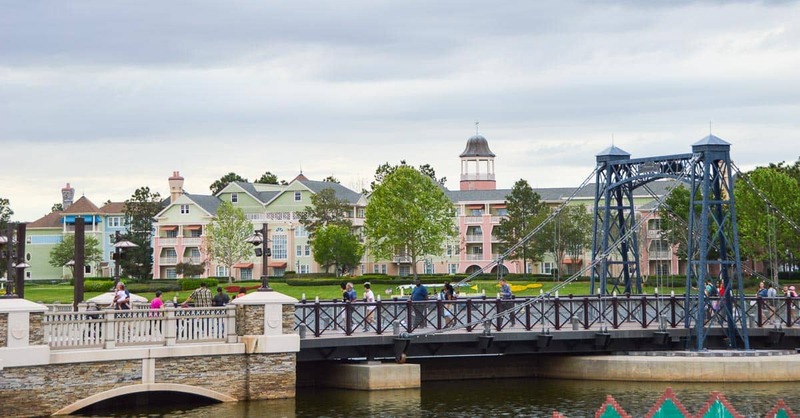 There is a convenient walking path that connects Saratoga Springs to Disney Springs, or you can take a water ferry for a relaxing ride. Buses are also available as a third transportation option. Grab your goggles, swimsuit, and towel, and get ready to cool off! Take your pick of great swimming pools at this resort. High Rock Spring is the main pool, complete with zero entry, a 128-ft water slide, two jacuzzi areas, and a mini slide for younger children. Lively afternoon activities are held daily here, and at night movies are shown in the grassy area next to the pool. Refreshing drinks and snacks can be found at On the Rocks pool bar. Check out the smaller pools in Congress Park, the Grandstand, and the Paddock for more swimming fun. The Paddock pool also features a waterslide and zero entry, and you can order a tasty lunch at the Paddock Grill. The pool in the Grandstand section has a cute water play area for younger guests, and a convenient pool bar can be found here as well. Ready to hit the parks? At Saratoga Springs, the only option, if you don’t have a car, is to take a bus. 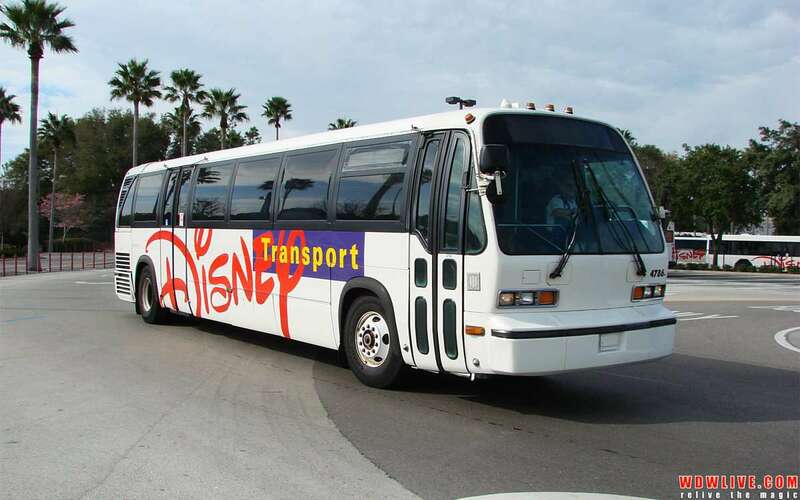 This is a drawback compared to some of the other Disney resorts that offer monorail transportation, a ferry, or are close enough to a park to walk. Hopping on a bus at Saratoga Springs will also mean stopping at each of the sections to pick up more guests until you finally leave the resort gates and get to the main road. Disney Springs is the only location that is within walking distance or is accessible via ferry. Experience resort living high in the treetops with a stay in the Treehouse Villas, a separate room category at Saratoga Springs. Each treehouse can sleep up to nine guests and includes a complete kitchen, a living and dining area, and a lovely private deck overlooking the peaceful woods. If you’re looking for larger-than-life Disney characters and over-the-top theming, you’re not going to find it at Saratoga Springs. The motif of horse racing and relaxation is elegantly woven throughout the resort, but it might not appeal to everyone. Experience Disney’s first-class Lake Buena Vista Golf Course during your stay at Saratoga Springs. The course takes golfers past serene lakes, towering trees, and the stately architecture of the resort’s guest buildings. The golf course has also played host to the LGPA Tour, the USGA, and the PGA Tour.